Five new commissions by early-career applied artists Hitomi Hosono, Matthew Raw, Revital Cohen and Tuur Van Balen, Shelley James and FleaFollyArchitects brought about through the biennial Jerwood Makers Open. Each combines a high level of technical skill with imagination and intellectual adventure, constituting a fresh and exciting direction of each artist’s work. Hitomi Hosono has made a series of delicate sculptures from porcelain inspired by the vibrancy of the South Pacific. This work marks the first time Hitomi has experimented with the use of colour in her botanical forms. 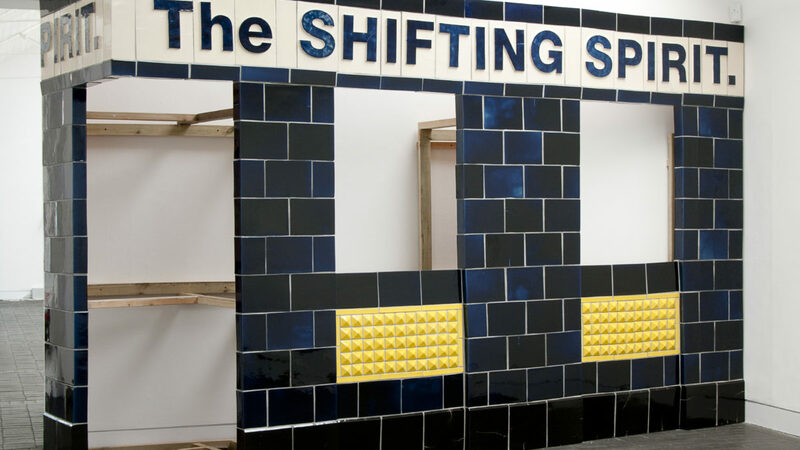 Matthew Raw has made a life-sized ceramic-tiled façade of a British pub inspired by historic turn-of-the-century designs and contemporary issues of gentrification. The work extends Matthew’s use of ceramics to fuse a relationship between narrative and structure. Revital Cohen and Tuur Van Balen’s work for this exhibition explores production processes within making and design to create a series of hand-crafted LED signs, which display fragments of text that come from the process of sourcing electronic components from China. Composed of sentences that have been either lost, or perhaps found in translation, the piece, called Giving More to Gain More, encapsulates the poetic moment in which computerised systems reinterpret language. Shelley James, whose practice investigates new techniques and the creative possibilities of glass, has developed a new series of glass works rooted in new scientific explorations of perception and the way we view space. FleaFollyArchitects’s work for this exhibition involves creating a fictional universe using the themes and characters from Mary Shelley’s Frankenstein as a metaphor for our digital age, especially how the Internet has changed from a tool for good to an uncontrollable monster of our own making. The 4m-tall work re-imagines Shelly’s monster as electronic archive situated in the Arctic Circle, which holds all of humanity’s existing and future digital information. The five artists were selected from over 240 applications in response to an open call for self-directed projects from UK-based makers within 10 years of establishing their practice. Each artist received a bursary of £7,500 to support experimentation and the making of new work for this exhibition. The five artists were selected by an independent panel comprising Vicky Richardson, Director of Architecture, Design and Fashion at the British Council; Junko Mori, artist and silversmith; and Claire Catterall, Director of Exhibitions and Learning at Somerset House. Jerwood Makers Open was established in 2010 to promote the significance of making and materials within the visual arts arena, seeking to support exceptional skill and imagination. Since 2010, Jerwood Charitable Foundation has awarded commissioning funds totalling £180,000 directly to artists through this project. It has supported 24 major new commissions, offering a rare opportunity for artists to freely develop creative ideas central to their individual practices. It looks broadly at how contemporary artists are defining or challenging the boundaries of what has traditionally been described as applied arts. Alumni include: Keith Harrison, James Emmanuel Boos and Nao Matsunaga.